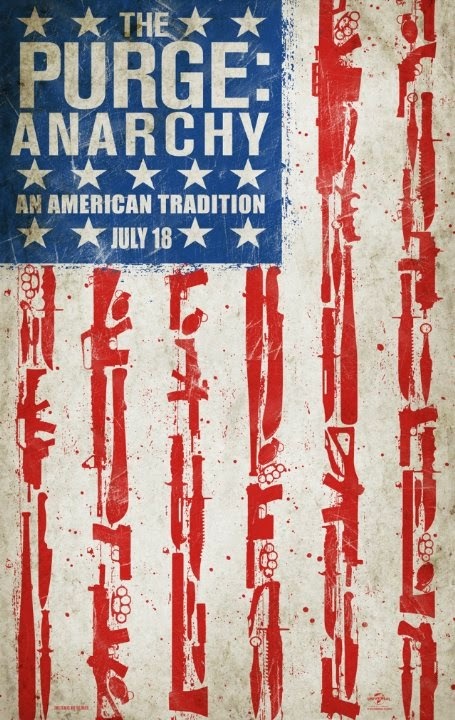 Synopsis: Taking place one year after the first film, The Purge: Anarchy follows 5 strangers from different walks of life - a nameless soldier with an axe to grind (Grillo), a mother (Ejogo) and daughter who were nearly kidnapped by an army, and a bickering couple whose car broke down at an inopportune time - as they try to avoid a masked gang and various Purgers while trying to make it to safety in downtown L.A. on the night of the annual Purge. Andrew: Hello dear readers! So we know we've been a little lax here lately as we still haven't published our review of Dawn of the Planet of the Apes, but we're here with our review of the only film we saw this past weekend - The Purge: Anarchy. Sarah, we actually sat down and watched The Purge a month or so ago which was your first time seeing it. So let's start this review off by comparing what you thought of the first one and it's relatively small-scale home invasion plot, and The Purge: Anarchy's much wider-scale. Sarah: First of all I want to say that these movies are silly. The premise really makes absolutely no sense. But they are kind of fun, in an extremely violent kind of way. The first one takes place solely in a Los Angeles mansion. It's in tight quarters and gives it more of a horror movie feel. There are elements of jumpiness and "who's around that corner?!" The new one is all over the city of L.A. It has a much more action movie feel to it, and I really liked that. It almost felt like it would be a great premise for a haunted house. I could totally see this as a walk-through at Universal Studios' Halloween Horror Nights for sure. A: I can see why you'd say the premise is silly, but not necessarily why it makes no sense. I still think these films have a very cool and interesting, even thought-provoking, concept. And while I enjoyed the first one and appreciated the cramped quarters and horror movie feel to it, I also thought the sequel was an improvement because it took the concept out into the larger setting of Los Angeles like most people hoped the first one would have. And in that vein I think this sequel also helped give more credence to the concept and made me further interested in seeing where they take the series from here because I want to know if the people rise up to overthrow the New Founding Fathers of America and thereby get rid of The Purge. who terrorize the film's protagonists. At least DeMonaco has that going for him. S: It will be interesting to see where they go with all of this. The Purge: Anarchy has something cool that the first one didn't really have, and that's interesting side characters. By that, I mean characters that are purging during the night that the main characters come across, but we never get to know their names. There's the butcher in the back of a semi-truck wielding a mounted machine gun that fires armor-piercing bullets. A fat woman shouting into a megaphone and waving around an AK-47. Creepy masked men riding dirt bikes and brandishing machetes. Old, rich Beverly Hills men and women bidding on people to kill. It all just added layers to the already gruesome city street scenes and I really enjoyed that. It just kind of fit. Definitely shows you a different side of this whole process. It's strange but somehow just works at the same time. A: Those were some of the things I liked best about this sequel - it expanded on the general concept in ways like you just described. We get to see all sorts of different purgers, not just the group of masked rich kids who terrorized the Sandin family in the first one. I mean, hell, the best part about the first film was the opening credits where we saw security and news footage of all different kinds of purging going on around the country. This time we get to see it firsthand throughout the movie. Speaking of characters, let's get to the main ones. Because they were some of the best and worst things about the film. Frank Grillo (Captain America: The Winter Soldier, Warrior) is awesome as the nameless, reluctant protagonist here. He's called "Sergeant" at one point in the film and he's very proficient with weapons, so clearly he was either in the military or in the police force at some point but no longer is. And other than knowing his young son was killed by a drunk driver - for which he wants revenge - we don't know much about him. And I liked it that way. S: I liked that, too. I didn't really want to know any more about him. The mystery is what kept it interesting. You could fil in the pieces that you thought were necessary but other than that he was a blank slate. This sounds like an oxymoron, but for a blank slate lead character he was also surprisingly developed well. Now...we have the other characters. The poor saps that get stuck out in the middle of L.A. during this terrible night. We have Eva and Cali Sanchez, played by Carmen Ejogo and Zoe Soul, as a mother/daughter duo; and then you have Liz and Shane, played by Kiele Sanchez (Lost) and Zach Gilford, as a couple struggling with separating. All four of these characters were a little…wanting. Soul was about the only one who showed any kind of passion but she wasn't quite believable. Every one else just seemed to be a little deflated. A: You pretty much nailed it on the head. I thought Ejogo and Soul did an OK job as mother and daughter, especially Soul as the fiery teenager that A.) impressed Grillo's Sarge enough by fighting back against some kidnappers that he decides to save them against his original plan, and B.) the headstrong one that doesn't take Sarge's bullcrap when he tries to set some perfunctory ground rules while escorting the group to safety. Sanchez and Gilford.....wow were they wasted. And I don't mean like they're talented actors who just didn't get much to do here, I mean their characters are so one-dimensional that the film probably could've exercised them entirely and would've felt the same. I liked the idea that they get stranded in downtown L.A. when their car dies just as The Purge commences, but other than that there's nothing to them. It doesn't help that the actors really aren't great, either. 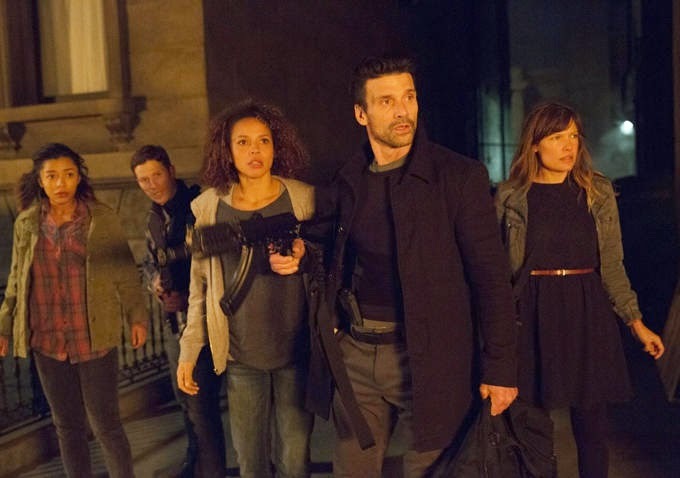 Frank Grillo (center, with gun) is a highlight of the film as the nameless solider/cop with revenge on his mind. The rest of the cast, however, is a total drag on the film and don't add much to the proceedings. S: Can I also say that Michael K. Williams, whom we love from his role as Chalky White on HBO's Boardwalk Empire, is utterly wasted here as a rebel leader? And that his dialogue is just really bad? A: Okay, yes! Thank you for pointing that out because that was going to be my next point - that the dialogue is just not good. I know the film's director, James DeMonaco, also wrote the script for both this and the first film. And he's just not a very good screenwriter when it pertains to how characters interact with one another. He could really use some help from another writer or two if he returns for the next film to help him punch up the dialogue and also flesh out some of these high concepts he's tried to get across in these movies. S: Yeah, the dialogue is just not great. I don't really know how one messes up so bad on something so simple. Just have your characters interact and not sound like complete bores! I mean, really, I would not be friends with any of these people. Sanchez and Gilford were just the worst. I really had a hard time with them. They were just so stupid that they were almost unbelievable as characters. I mean, who stops to go to the grocery store 30 minutes before a killing spree begins?! Did you really need eggs before the next day? A: Haha, that's a good point! And I'd rather not delve into the rabbit hole that could cover any plot holes, but there's one particularly laugh worthy moment where a character yells at another if they have a car or not to help them get away, despite the fact that they had literally JUST gotten out of a perfectly fine car themselves. But I digress. 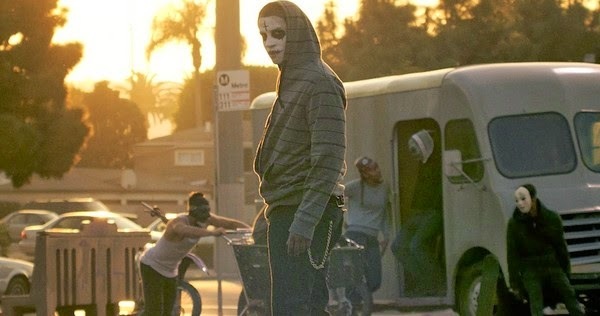 It may not sound like it from what we've been saying so far, but I actually enjoyed this The Purge: Anarchy. I thought the action was pretty great. I think it has a number of pretty cool sequences that are shot in beautiful ways (like a certain night-vision sequence). It's all the smaller details that make up this world DeMonaco has created that I really dig, he just misses the mark with broader aspects of it. This movie almost has a video-game feel to it that I enjoyed. It's about survival, it's about getting from Point A to Point B to Point C while avoiding or overcoming other hurdles that come along. And there's a time limit to all of it. I dug that, just like I dig the first film. S: These movies are fun. While I think the premise is a little silly, I do love the visual elements that these movies have. They're different and I can appreciate the craziness like if the Purge actually existed. The dialogue and story lines aren't fantastic but the action and gun-fights are solid and all take place in a great arena. And you're so right! They do have a video-game quality to them. I enjoyed it. Didn't love it but definitely thought that it was entertaining. I definitely think that is important. A: I'm going to give this one a similar score to the one I gave the original film, with a respective uptick in score based on the uptick in the movie's quality. So I'm giving this one a 3/5. S: I'll give it a 2.5/5 for entertaining me.